Works up to 10,000 gallons and lasts between 6 - 12 months before replacement. There might be hazards when absorbing chemicals into your skin while bathing . 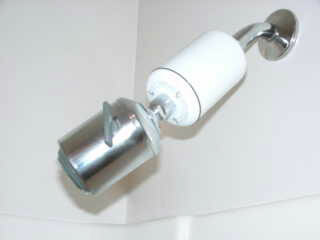 Also beware of the common risk when breathing shower steam containing chlorine. Benefits of filters are many... most people enjoy their shower filter because they receive a more gentle reaction to hair colors and other treatments... extending time between expensive salon visits. 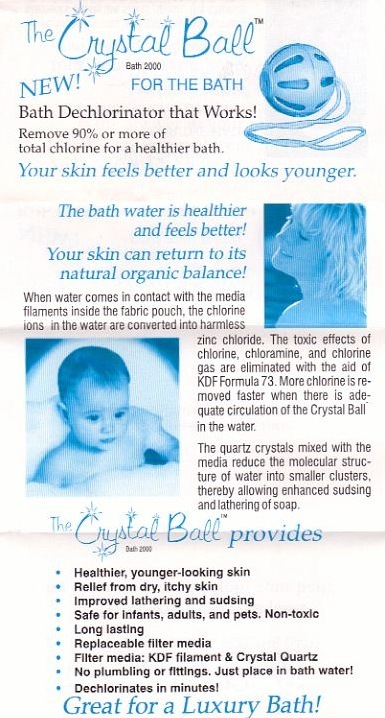 The Crystal Ball treats bath water by placing it into the tub and pulling it through the water a few times with the use of an 18" lanyard attached to the top of the crystal bath ball filter. * Help against allergic reactions. *	Relief from dry, itchy skin. *	Improved lathering and sudsing. *	Safer for infants, adults and pets. *	No skin and eye irritation. *	No relation to Al Qaeda. *	Just makes you feel better.